A taxonomy, simply put, is a system of classification. Researchers create taxonomies so that they have a shared lexicon for talking about complex systems. A good example of a taxonomy is the periodic table of elements, presented by Dmitri Mendeleev (1834-1907) to the Russian Physico-Chemical Society and published in the Zeitschrift fϋr Chemie in 1869. The Periodic Table has been developed and expanded since then, but the system that Mendeleev presented gave scientists a core system for thinking about and discussing some of the basic building blocks of the universe. The table groups elements by their atomic number and gives a sense of the behavior of each element by organizing them in rows and columns. When it comes to studying deep history, the periodic table is just one important taxonomy to which researchers refer. Others include the Global Boundary Stratotype Sections and Points (GSSP) as well as a series of different systems for organizing biological organisms. The taxonomy for the GSSP is maintained by the International Commission on Stratigraphy (ICS). Their system links chronological periods to geological strata. Each geological layer, indicates large-scale historical planetary transformations. For example, mass extinction events are indicated by fossil records -- or lack thereof -- embedded in the strata. In linking geological strata to chronological periods , the ICS has developed the following nomenclature. In this course, we will nearly always refer to geochronological categories. So, it's important to understand how they work. You might think of these categories as a nesting hierarchy. An Eon is the longest timeframe while an Age is the shortest timeframe recognized by ICS. An Eon may include many eras, and an Era may include many Periods. However, a Period will never encompass an Era, and an Era will never encompass an Eon. An easier way to think about this is to refer to the geochronological/geostratigraphical taxonomy created by ICS. 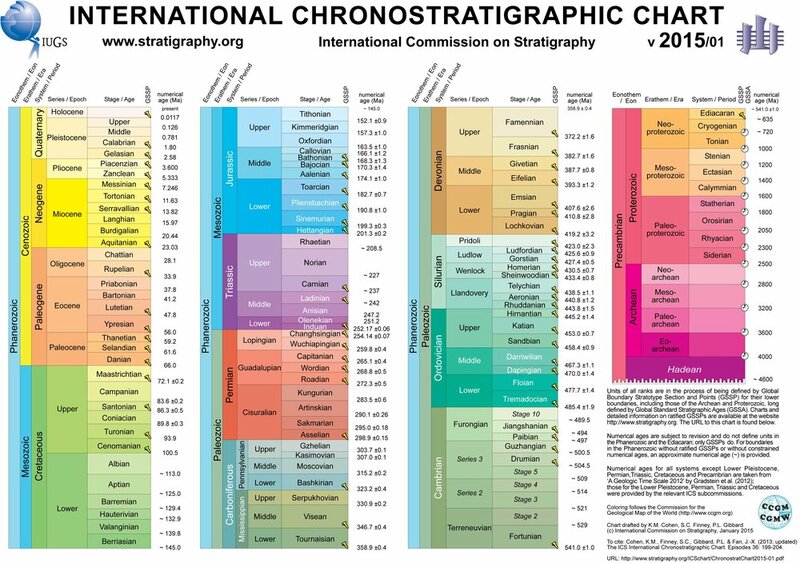 Using this chart, you will note that ICS has formalized only four Eons: the Hadean, the Archean, the Proterozoic, and the Phanerozoic. Looking more closely, you will see that we currently live in the Phanerozoic Eon, the Cenozoic Era, the Quaternary Period, and the Holocene Epoch. As we will discuss in class (as well as my course on the Anthropocene next semester), ICS is debating new nomenclature for the Epoch in which we live. The debates surrounding this proposed revision reveal two important points about this geological taxonomy. First, the geochronological system is constantly being revised to reflect new discoveries and new interpretations of these discoveries. Second, these revisions are not value neutral. They exist within professional, social, economic, and political debates. This is especially true in the current debate over creating a new Epoch -- the "Anthropocene". A system for dating geological strata is relatively straightforward when compared to creating a taxonomy for biological organisms. Not only is the variety of life on this planet incredibly diverse, but it has been evolving for billions of years. Because of this biologists are left with fundamental problems of categorization. Is it possible to create a taxonomy that describes all life on the planet today and accounts for each species' mutation over time and describes all of the extinct organisms in the planet's history? Even doing one of these things is daunting; integrating all of them seems nearly impossible. Whether you know it or not, most of you are already familiar with the most prominent system of biological classification: the Linnaean system developed by Carl Linnaeus (1707-78) in the eighteenth century. It's from this system that we get the category Homo sapien. As with geochronology, the Linnaean taxonomy, which has evolved substantially since the eighteenth century, has a nesting hierarchy of terms. A Kingdom has multiple Phyla; a Class has multiple Orders; and so on. Each species fits into exactly one of each of these categories. Thus, scientists classify humans as follows. You'll notice that the designation Homo sapien is a product of naming our Genus and our Species. This system for identifying animals is known as "binomial nomenclature". All species can be described using a binomial designation. So, for example, a Gray Wolf is Canis lupus while an Ostrich is Struthio camelus. Unlike the ICS, which focuses on geochronology, there is no single organization that governs naming all life on the planet. Instead, various organizations govern different areas of biological classification. The International Botanical Congress, for example, is responsible for maintaining the "International Code of Nomenclature for algae, fungi, and plants." For animals, the International Union of Biological Sciences (IUBS) appoints an International Commission on Zoological Nomenclature (ICZN) which, in turn, maintains the International Code of Zoological Nomenclature. The strength of the Linnaean system is that it is a handy tool for categorizing the vast array of life on the planet. Its weakness is that the system was developed when few people believed that evolution was possible. It is a relatively static system that has difficulty accounting for the dynamic process of evolution. This limitation became increasingly clear after Charles Darwin and Alfred Russel Wallace published their breakthrough theories of evolution in the nineteenth century. If species changed over time, how would it be possible to categorize them in a useful way? The solution to this problem that has become most prominent among researchers is an approach known as Cladistics. Cladistics takes phylogenetic data (morphological and molecular information that examines evolutionary change) and tries to group organisms together according to a common ancestor. Cladistics groups all descendants of a common ancestor in a category known as a "clade." Each clade can have subclades, but the designation of a clade can be applied only to groups with a common ancestor. As you can probably imagine, new methodologies and new discoveries constantly force scholars to rework and improve their models. One prominent example of this has been the recent change to the Family Hominidae, to which humans belong. When genetic analysis revealed that orangutans, gorillas, and chimpanzees are more closely related to humans than once thought, scientists added them to the Hominidae (removing them from the Family Pongidae and, in turn, making Pongidae obsolete). Subcategories of Family further refined the relationship between humans and the other apes. Humans joined gorillas and chimpanzees in the Subfamily Homininae, which was further subdivided into the Tribe Hominini, including humans and their closest extinct ancestors. Thus, refining our classification of humans, which I showed above, a more thorough chart would look as follows. You will often read in older books or hear in older documentaries that humans are "hominids". This is still correct in the sense that they are part of the Family Hominidae. However, the older definition of a hominid excluded the so-called "great apes" and thus had a much more restricted meaning. Newer works will generally refer to humans and their close ancestors as "hominins," referring to the Tribe Hominini. In this class, we will try to follow the more recent designation which distinguishes humans from other apes by the term hominin. As you can see, taxonomies are incredibly valuable for helping us understand our world. They can also be exceptionally complex. And, as you have probably gathered from this post, they are neither static nor perfect. To a certain extent, they have to be arbitrary -- making artificial divisions and structures in order to facilitate scholarship and discussion. This artificiality and their constantly changing structure make them valuable documents to historians of science, who can explore revisions for shifting scientific sentiments, philosophies, social contexts, and more.